Manufactured using the highest quality materials and to rigorous safety standards, our 28mm 6×36 stainless steel wire rope and lift and manoeuvre heavy loads in various challenging environments. There are two sets of load capacities listed for this rope, because like the other products in our 6×36 range, there are a pair of competing core types to consider. The independent wire rope core provides a 44,668kg WLL, as well as a breaking force of 438kN. The fibre core rope has a 41,406kg capacity, while its breaking force sits at 406kN. This clear distinction in terms of safe working load is also reflected in the flexibility of these rope variants. The fibre core offers improved suppleness, in exchange for its lower load rating. With corrosion resistance assured, as with every configuration of stainless steel wire rope we supply, either 28mm example will be a long lasting lifting component. 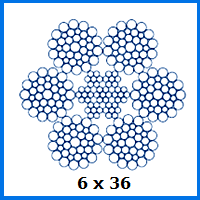 Should the 6×36 arrangement of wire bundles not offer enough strength at this diameter, our 1×19 stainless steel range might be more suitable. The 26mm variant has a capacity of almost 57 tonnes, while also being resilient enough for use in maritime conditions. Meanwhile our non-rotating stainless steel rope with a 18×7 configuration of wire bundles does not offer especially high WLLs, but does deliver that all important resistance to twisting during use that some buyers may value. To get our team on-side, just call 01384 78004 or email them today. You can easily get help with wire rope questions, or request a quote before you order. 28mm 6x36 Stainless Steel Wire Rope Overall rating: 5 out of 5 based on 6 reviews.